Learn how to build a delete record page in Dreamweaver that allows users to delete records in a database. Your application can contain a set of pages that lets users delete records in a database. The pages normally consist of a search page, a results page, and a delete page. A delete page is usually a detail page working in tandem with a results page. The search and results pages let the user retrieve the record and the delete page lets the user confirm and delete the record. After creating the search and results pages, you add links on the results page to open the delete page and then build a delete page that displays the records and a Submit button. When users want to delete a record, they must first find that record in the database. Accordingly, you need a search and a results page to work with the delete page. The user enters search criteria in the search page and selects the record on the results page. When the user clicks the record, the delete page opens and displays the record in an HTML form. After creating the search and results pages, you must create links on the results page to open the delete page. You then modify the links to pass the IDs of the records the user wants to delete. The delete page uses this ID to find and display the record. On the results page, create a column in the table used to display records by clicking inside the last table column and selecting Modify > Table > Insert Rows or Columns. Select the Columns option and the After Current Column option, and click OK.
A column is added to the table. In the newly created table column, enter the string Delete in the row containing the dynamic content placeholders. Make sure you enter the string inside the tabbed repeating region. You can also insert an image with a word or symbol for delete. Select the Delete string to apply a link to it. In the Property inspector, enter the delete page in the Link box. You can enter any filename. After clicking outside the Link box, the Delete string appears linked in the table. If you Live view, you can see that the link is applied to the same text in every table row. Select the Delete link on the results page. The question mark tells the server that what follows is one or more URL parameters. The word recordID is the name of the URL parameter (you can make up any name you like). Note the name of the URL parameter because you'll use it in the delete page later. In the Server Behaviors panel (Window > Server Behaviors), click the Plus (+) button, and select Go to Detail Page from the pop‑up menu. In the Detail Page box, click Browse and locate the delete page. In the Pass URL Parameter box, specify the name of your parameter, such as recordID. You can make up any name you like, but take note of the name because you'll use it in the delete page later. Specify the value you want to pass to the delete page by selecting a recordset and a column from the Recordset and Column pop‑up menus. Typically the value is unique to the record, such as the record’s unique key ID. Select the URL Parameters option. The first part of the URL, http://www.mysite.com/confirmdelete.asp, opens the delete page. The second part, ?recordID=43, is the URL parameter. It tells the delete page what record to find and display. The term recordID is the name of the URL parameter and 43 is its value. In this example, the URL parameter contains the record’s ID number, 43. After completing the page listing the records, switch to the delete page. The delete page shows the record and asks the user if they're sure they want to delete it. When the user confirms the operation by clicking the form button, the web application deletes the record from the database. Building this page consists of creating an HTML form, retrieving the record to display in the form, displaying the record in the form, and adding the logic to delete the record from the database. Retrieving and displaying the record consists of defining a recordset to hold a single record—the record the user wants to delete—and binding the recordset columns to the form. The delete page can contain only one record-editing server behavior at a time. For example, you cannot add an Insert Record or an Update Record server behavior to the delete page. Create a page and save it as the delete page you specified in the previous section. You specified a delete page when you created the Delete link in the previous section. Use this name when saving the file for the first time (for example, deleteConfirm.cfm). Insert an HTML form on the page (Insert > Form > Form). Add a hidden form field to the form. The hidden form field is required to store the record ID passed by the URL parameter. To add a hidden field, place the insertion point in the form and select Insert > Form > Hidden Field. Add a button to the form. 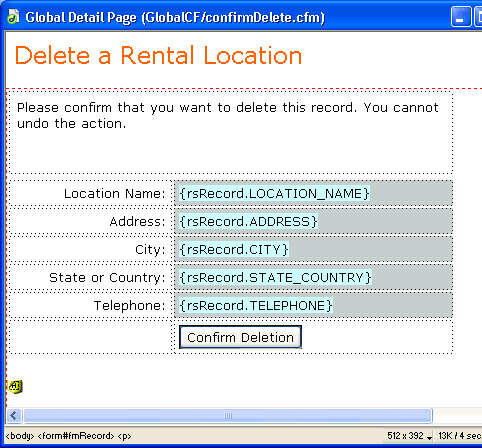 The user will click the button to confirm and delete the displayed record. To add a button, place the insertion point in the form and select Insert > Form > Button. Enhance the design of the page any way you want and save it. In the Bindings panel (Window > Bindings), click the Plus (+) button and select Recordset (Query) from the pop‑up menu. 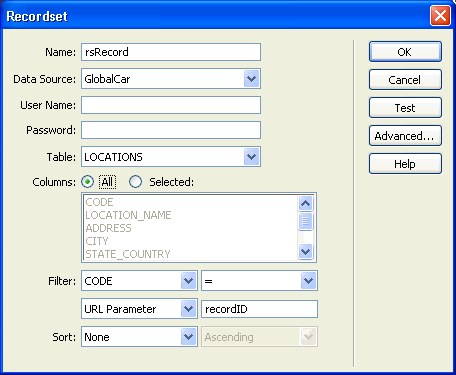 The simple Recordset or DataSet dialog box appears. If the advanced Recordset dialog box appears instead, click Simple. Name the recordset, and select a data source and the database table that contains the records that users can delete. In the Columns area, select the table columns (record fields) you want to display on the page. To display only some of the record’s fields, click Selected and choose the desired fields by Control‑clicking (Windows) or Command-clicking (Macintosh) them in the list. Make sure to include the record ID field even if you won't be displaying it. From the first pop‑up menu in the Filter area, select the column in the recordset containing values that match the value of the URL parameter passed by the page with the Delete links. For example, if the URL parameter contains a record ID number, select the column containing record ID numbers. In the example discussed in the previous section, the recordset column called CODE contains the values that match the value of the URL parameter passed by the page with the Delete links. From the pop‑up menu beside the first menu, select the equal sign, if not already selected. From the third pop‑up menu, select URL Parameter. The page with the Delete links uses a URL parameter to pass information to the delete page. In the fourth box, enter the name of the URL parameter passed by the page with the Delete links. The recordset appears in the Bindings panel. Select the recordset columns (record fields) in the Bindings panel, and drag them to the delete page. Make sure you insert this read-only dynamic content within the form boundaries. For more information on inserting dynamic content in a page, see Make text dynamic. Next, you must bind the record ID column to the hidden form field. Make sure Invisible Elements are enabled (View > Visual Aids > Invisible Elements), and then click the yellow shield icon that represents the hidden form field. The hidden form field is selected. In the Property inspector, click the lightning bolt icon beside the Value box. In the Dynamic Data dialog box, select the record ID column in the recordset. 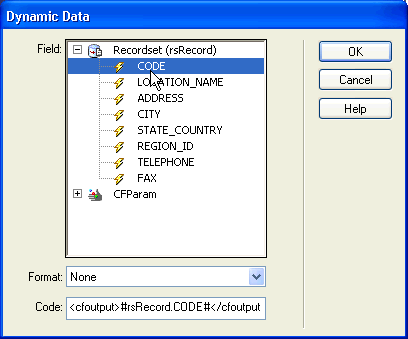 In the following example, the record ID column, CODE, contains unique store codes. Click OK and save the page. After displaying the selected record on the delete page, you must add logic to the page that deletes the record from the database when the user clicks the Confirm Deletion button. You can add this logic quickly and easily by using the Delete Record server behavior. Make sure the ColdFusion or PHP delete page is open in Dreamweaver. In the Server Behaviors panel (Window > Server Behaviors), click the Plus (+) button, and select Delete Record. In the First Check If Variable Is Defined box, make sure Primary Key Value is selected. You specify the primary key value later in the dialog box. In the Connection or Data Source (ColdFusion) pop‑up menu, select a connection to the database so that the server behavior can connect to the affected database. In the Table pop‑up menu, select the database table that contains the records that will be deleted. 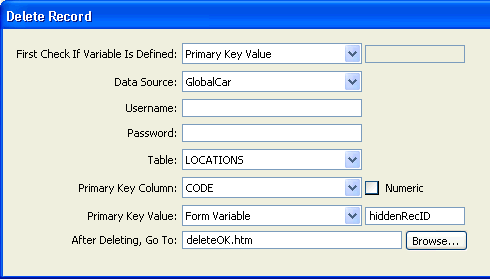 In the Primary Key Column pop‑up menu, select the table column that contains record IDs. The Delete Record server behavior searches this column for a match. The column should contain the same record ID data as the recordset column you bound to the hidden form field on the page. If the record ID is numeric, select the Numeric option. (PHP) In the Primary Key Value pop‑up menu, select the variable on your page that contains the record ID identifying the record to be deleted. The variable is created by your hidden form field. It has the same name as the name attribute of the hidden field and is either a form or URL parameter, depending on the form’s method attribute. In the After Deleting, Go To box, or the On Success, Go To box, specify a page to open after the record has been deleted from the database table. You can specify a page that contains a brief success message to the user, or a page listing the remaining records so that the user can verify that the record has been deleted. Click OK, and save your work. Make sure the ASP delete page is open in Dreamweaver. In the Connection pop‑up menu, select a connection to the database so that the server behavior can connect to the affected database. Click the Define button if you need to define a connection. In the Delete from Table pop‑up menu, select the database table that contains the records to be deleted. In the Select Record From pop-up menu, specify the recordset that contains the records to be deleted. In the Unique Key Column pop-up menu, select a key column (usually the record ID column) to identify the record in the database table. If the value is a number, select the Numeric option. A key column usually accepts only numeric values, but sometimes it accepts text values. In the Delete By Submitting pop-up menu, specify the HTML form with the Submit button that sends the delete command to the server. In the After Deleting, Go To box, specify a page to open after the record has been deleted from the database table. Upload the search, results, and delete pages to your web server, open a browser and search for a disposable test record to delete. When you click a Delete link on the results page, the delete page should appear. Click the Confirm button to delete the record from the database. Verify that the record has been deleted by searching for the record again. The record should no longer appear in the results page.